When running a business, it is important to keep the office or facility clean to maintain the look of the space and provide your employees with a clean working environment. A clean environment will improve employee morale and cut down on sick days, and the professional appearance will leave a good impression with clients, visitors, and business partners. The most effective way to maintain the cleanliness and appearance of your work space is to have the carpet professionally cleaned. A dirty or stained carpet in a commercial building can negatively impact the look of the entire space. ServiceMaster by Alpha Restoration provides commercial carpet cleaning services for offices and commercial buildings in Coral Gables, FL. Our technicians use advanced carpet cleaning equipment and cleaning products to remove dirt and stains from all types of commercial carpeting. These services will restore the original color and appearance of your carpet and help it last longer. We can schedule regular carpet cleanings for businesses in Coral Gables, FL to ensure that their carpeting is regularly maintained. Carpeting in commercial spaces needs to be cleaned often because it is subject to stains and dirt buildup from the high volume of foot traffic. Dirt and debris accumulate within the carpet fibers and as the debris builds up, it can cause the color of the carpet to fade and even cause damage to the fibers and wear out the carpeting. You can help reduce the buildup of dirt and debris, but it will not remove the debris that is lodged deep in the carpet fibers. This is why you should have the carpet professionally cleaned regularly. You should hire a professional to clean the carpeting in your commercial space at least every quarter. If you have a high volume of foot traffic in your building, you should consider more frequent cleanings. Regular cleanings will help maintain the appearance of the carpeting and reduce wear and tear, extending the life of your carpet and saving you the cost of replacement. At ServiceMaster by Alpha Restoration, we can thoroughly clean all types of carpeting in commercial spaces using state-of-the-art cleaning equipment and advanced cleaning products and stain removers. We are flexible with our scheduling so we can arrive at a time that is most convenient for your business. We can usually complete the carpet cleaning within one day, the exact time will depend on the size of the carpet. 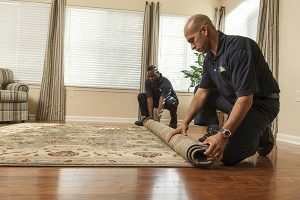 The carpet will be ready to use again 6-8 hours after the cleaning, but you must wait to put heavy furniture back on the carpet for at least two days. Inspection: Our technicians will start by inspecting the carpeted area and providing an estimate based on our assessment. Pre-spray: The carpet is then pre-sprayed to loosen dirt and stains. Extraction: We use advanced equipment to deposit a hot water cleaning solution directly into the carpet fibers and immediately extract the solution and dirt back out. Rinse: After the cleaning, the carpet is rinsed to ensure that the detergent and cleaning products are removed. Post-treatment: We will treat the lingering stains after the cleaning. Final inspection: We will inspect the carpet with you once we are done to ensure that you are happy with the results. Contact our professionals at ServiceMaster by Alpha Restoration if you are interested in regular carpet cleaning services for your business in Coral Gables, FL. We will work with you to create a cleaning schedule and provide effective cleaning services that will improve the lifespan and appearance of your carpet. You can reach us at (305) 707-6135 to learn more about our commercial carpet cleaning services or to schedule an appointment.